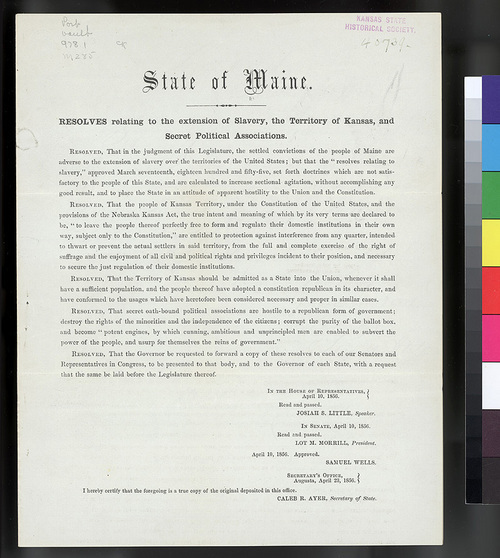 The full title of this document is "State of Maine Resolves relating to the extension of slavery, the territory of Kansas, and secret political associations." The state legislature of Maine issued this statement listing their five resolutions about the state of affairs in Kansas Territory. The state legislature is against the expansion of slavery and they want the fate of Kansas Territory to be decided by the people living in the territory, without outside interference from hostile political organizations. The document is signed by Josiah S. Little of Maine's House of Representatives, Lot. M. Morrill of the Senate, and Samuel Wells of the Secretary's Office. Caleb Ayer certified that this copy of the original document is fully accurate.